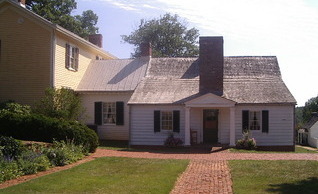 The original part of Monroe's home, Higland. As the crow flies, the home of James Monroe, Ash Lawn-Highland, is just ½ a mile from the base of Monticello. Monroe, the fifth president of the United States, and Jefferson were close friends, and often visited each other. However, compared to Monticello, Ash Lawn-Highland is nowhere near as imposing. As a result, it often gets a bum rap (even among locals) as being of little interest. So we were pleasantly surprised when we finally visited the home of James Monroe. We went on a special Educator’s Weekend (offered annually, usually in September) which gives free admission to educators (but not homeschoolers, unfortunately). 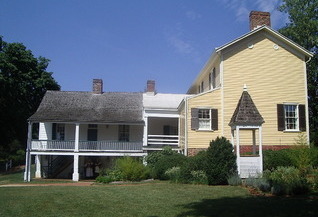 The existing building really has two parts: the original, white section, built by James Monroe, and yellow, two-story addition, added in the 19th century. You enter through this newer section, where the guide gives you an overview of the house and Monroe. Then it’s on to the “authentic” part of the house. The rooms are much smaller than Monticello’s, which gives it a cozier feel. In the last room, the bedroom, a costumed interpreter pretending to be James Monroe came in and spoke to us, telling us how he had recently left the presidency and was looking forward to his retirement at Ash Lawn-Highland. He stayed completely in character and was very amusing. Downstairs, we toured the kitchens, which were full of interesting artifacts, then moved on to the restored slave manager’s house, where they had a costumed interpreter pretending to be a slave practicing the art of quilling (taking narrow strips of paper, rolling them into tight circles, then gluing them into designs and sculptures. Since we were there on a special event day, the museum had a variety of costumed interpreters on hand. In addition to “James Monroe” and the slave, they also had a colonial “soldier” demonstrating how to fire a colonial shotgun, and a housekeeper serving a strawberry mint punch (similar to the punch served on the Michie Tavern tour). Ash Lawn-Highland is known for its peacocks, which are occasionally seen strutting across the lawn. There used to be quite a few, but now are only a couple. You might catch sight of one on the lawn, or see one in a cage back behind the house. At the front of the house of sculptured gardens with a large statue of Monroe. Overall, the tour is surprisingly good, especially if you can arrange to go on a special day when they have more costumed interpreters. And even in the height of the summer season you'll find far fewer crowds than at Monticello. James Monroe was born on April 28, 1758, in Westmoreland County, Virginia. He grew up on a 600-acre tobacco farm, went to the Williamsburg's College of William and Mary, and joined the Third Virginia Regiment in 1776. 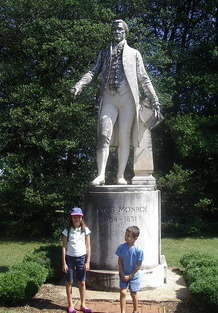 The kids are dwarfed by the statue of James Monroe. At 18, he was part of George Washington's historic crossing of the Delaware River in 1776, as well as during the harsh winter at Valley Forge. After leaving the army as a Lieutenant Colonel, he went to Williamsburg where he met Governor Thomas Jefferson. They hit it off, and formed the beginning of a close friendship that would last all their lives. Tall and thin like Jefferson, he was more retiring, and generally seen as less intellectual his brilliant neighbor. In 1786, Monroe married Elizabeth Kortright and moved to his family home, then called Highland, next to Jefferson's Monticello. For the next twenty-four years he and Elizabeth lived there and raised three children. Monroe's public service began in 1782 when he was elected to the Virginia General Assembly. He served in both the Confederation Congress and the first United States Senate, four one-year terms as Governor of Virginia, and became President James Madison's Secretary of State and Secretary of War during the War of 1812. He also spent a fair amount of time in Europe, serving different times as Minister to France, Britain, Spain. Many feel Monroe's greatest achievement as a diplomat his role in the negotiating the Louisiana Purchase from Napoleon in 1803. This instantly doubled the size of the United States. He was elected President of the United States in 1816 and in 1820. His notable achievements included smoothing things over with the British after the War of 1812, buying Florida from Spain, and proclaiming the Monroe Doctrine, which basically put the world on notice that America would do whatever was necessary to protect American interests (not so different from today!). Unfortunately, like Jefferson, Monroe ended up deeply in debt. He was forced to sell Highland in 1826. Monroe died in New York City on July 4, 1831, exactly five years after the deaths of presidents Jefferson and Adams. He's buried at Hollywood Cemetery in Richmond, Virginia. Military who are members of Blue Star Museums, plus up to 5 family members, are free Memorial Day through Labor Day. Local Residents: $8.00 (Includes the counties of Albemarle, Augusta, Buckingham, Fluvanna, Greene, Louisa, Nelson, Orange and Rockingham) - one FREE admission with a paying guest. Other nearby attractions include Monticello, home of Thomas Jefferson, Michie Tavern, and Carter's Mountain Orchard. For the special walk you shouldn't miss, and our review of Monticello, click here. To find out why we were pleasantly surprised by our tour of Michie Tavern, click here. To learn about Carter's Orchard, a fantastic orchard with the best view of Charlottesville, click here. If you're planning to see the other local attractions, it's a good deal to purchase the Presidents’ Pass (you'll save $5). This discount combination ticket to Monticello, the Michie Tavern tour, and Ash Lawn-Highland costs $29 for adults and $17.50 for children, and is sold at the three locations. The pass is good for one visit to each site and has no expiration date. Presidents’ Pass tickets can be purchased at any of these sites, or in advance at www.monticello.org.